Cajun roast chicken. Easy. Delicious. 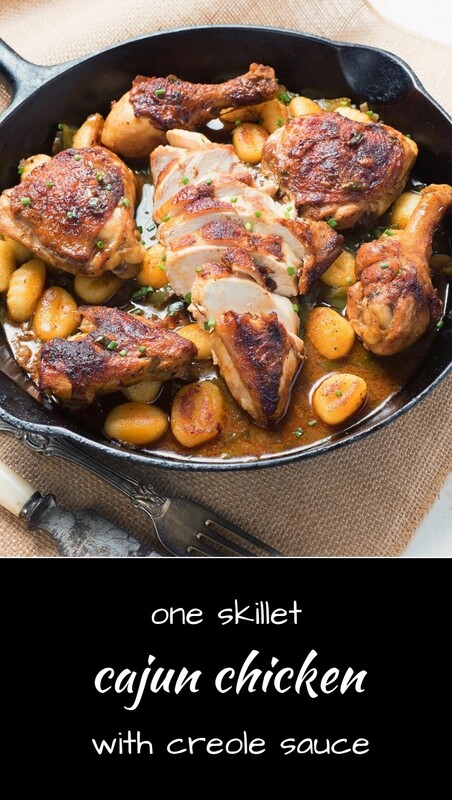 One skillet. It’s perfect for weeknight dinners when you feel the need to eat something new. Something that just hits the spot. I’m a cajun addict. There. I said it. Now you know. Somewhere along the way cajun stopped being cool. It was all the rage at one point. Cajun everywhere. You couldn’t go anywhere without seeing blackened fish or dirty rice or a cajun chicken sandwich. Trends come and go, I guess. But I never stopped loving it. I don’t actually know why it fell out of favour. It’s such good eating. Maybe a little unhealthy sometimes because of the roux and the butter and all the salt. But it doesn’t have to be all about fat. There’s tons of flavour to be had without adding a pound of butter. The pre-fab spice mixes are the other problem I think. Tons of salt. Not much anything else. There are good ones but they are all salty. And that limits how much flavour you can get into the dish. This cajun chicken isn’t unhealthy. Not a lot of fat. Just the right amount of salt. But a whole lot of cajun flavour. It’s ridiculous what store bought cajun spice costs. Put a celebrity name on something and all of a sudden it’s $10. There’s nothing to cajun spice. 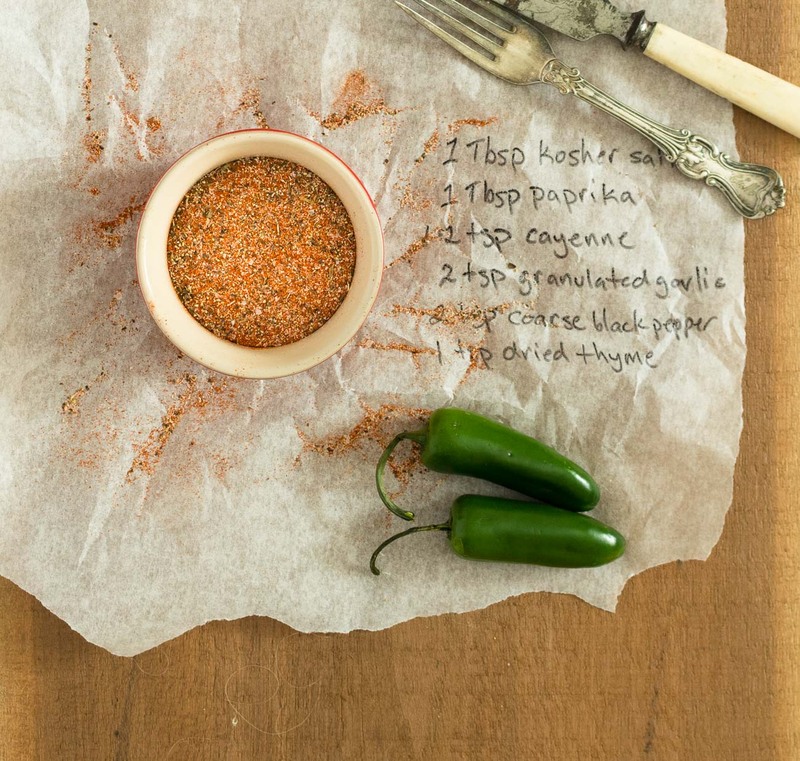 Creole seasoning. It’s everyday herbs and spices and some salt. Probably less than a buck to make a batch. Thyme, paprika, cayenne, granulated garlic, black pepper and salt. How hard is that? Takes about 3 seconds to make. And it’s delicious. Plus if you make your own you control the salt. Add more salt separately if needed. No reason why they have to be in the same container. This is pretty easy dish to make. Stovetop then oven then plate. It’s a good technique to learn. All sorts of dishes can be made this way. Not just chicken either. Chops of any sort work really well this way. Season your chicken or chops. Pan fry them in a bit of oil until browned. Then into the oven until they get to your target internal temperature. Out of the oven. Remove the chicken or chops from the pan. Make a sauce. Serve. The reason it works is you don’t have to cook everything through on the stove top. It’s way easier to get something evenly cooked in the oven. But you get the initial sear. That gives you that extra flavour boost. Gives this cajun chicken extra crispy skin. Don’t give up on cajun cooking. Even if it’s not trendy anymore cajun chicken is crazy tasty stuff. Easy enough for a weeknight but good enough for a dinner party. Try it. You’ll see. 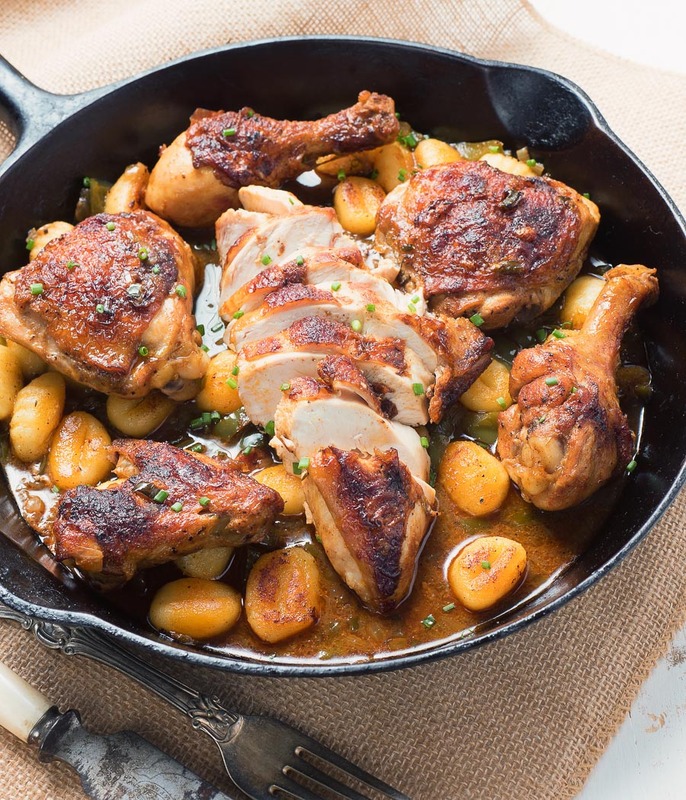 Cajun roast chicken is a one skillet dinner that's a snap to make but doesn't skimp on big, bold tastes. Use low salt creole seasoning or the dish will turn out too salty. 1 3-4 lb chicken - cut into 8 pieces or 4 breasts or 8 thighs. Pre-heat your oven to 400F. Season the chicken liberally with cajun spice. 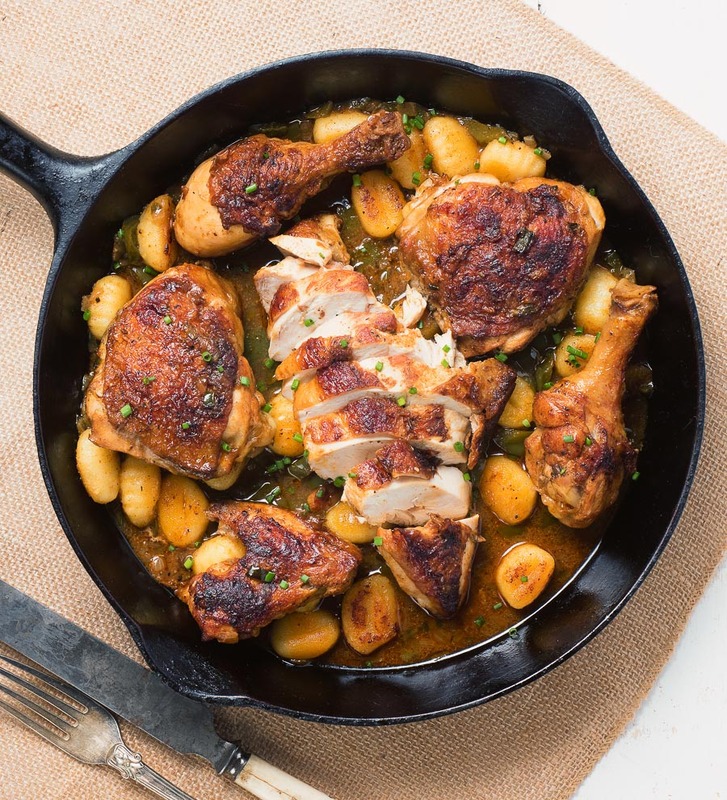 Heat the oil in a skillet large enough to hold all the chicken in a single layer over medium heat. Place the chicken in the skillet, skin side down, and cook until the skin is golden brown (about 4 minutes). Flip the chicken and cook another 3-4 minutes. Remove the chicken and drain all but 3 Tbsp of the fat in the pan. Add the green pepper, onion and jalapeño and cook until the onion is soft, about 4-5 minutes. Stir in the cajun spice and cook about 30 seconds. Add the flour and cook another 30 seconds. Add 1/2 cup chicken stock and stir. It will be crazy thick at this point. Stay calm. Cook on. Mix in the rest of the stock. Bring to a simmer. Add the chicken, skin side down and roast 10 minutes. Make sure any juices find their way into the pan as well. Juices are more flavour! Flip the chicken, skin side up and roast to an internal temperature of 165F, another 10-12 minutes. Depending on how hot the jalapeño is you may find this dish pretty spicy. If you are not a fan of hot cut back to 1/2 jalapeño. I love your site. Having trouble changing my preferences. My sister gets all you recipes , I don’t. I re subscribed and it said I opted out of emails — oops , never wanted that. Tried fixing it and going in circles. Can you HELP please. I DO want all your recipes. Gratefully Theresa.Hammond. Thanks. Thanks for he kind words Theresa. I’ve you an email to try to resolve this problem. I want you to get my recipes too! This chicken had amazing flavours. I liked that the creole seasoning had reduced sodium. I used one jalapeño and the heat was good for us. My three boys had seconds and said, “Make it again!” A real hit. That’s great to hear. So glad you and the boys liked it! Are those gnocchi in the pan with the chicken? Yes they are. I like gnocchi boiled until just done then gently fried in butter as a starch.